These documents are for use by a Medical Representative only (social worker, clinical trial coordinator, doctor or nurse, etc.) and are password protected. We will continue to make changes to the documents so please return here to print the most current versions. Older versions of this application will slow the process. 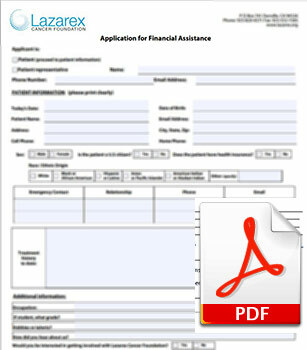 If you are a patient, please contact Lazarex Cancer Foundation directly for assistance with clinical trial expenses or for help with clinical trial identification.